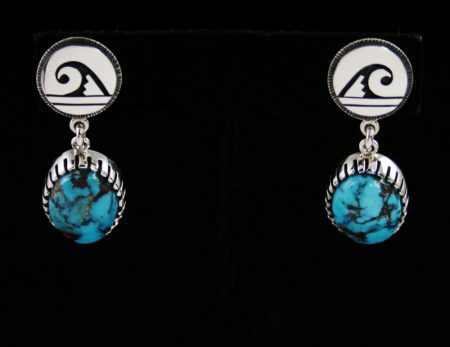 This gorgeous pair of dangle earrings and matching pin/pendant were hand made by award winning Hopi artist, Chalmers Day. 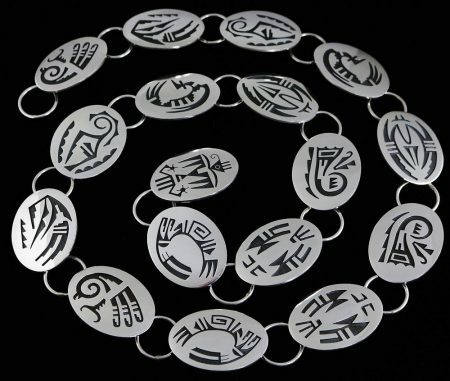 Each piece features stunning Mudhead Kachina designs brought out with a darkened background. The Mudhead Kachina are the messengers, warriors and magicians. The knobs on their heads carry the seeds and particles of soil which are gathered from human footprints. This earth is what gives them power over the people. 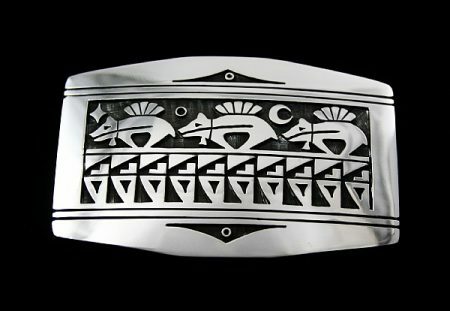 With incredible skill and precision award winning Hopi artist, Chalmers Day created an elegant one of a kind belt buckle. 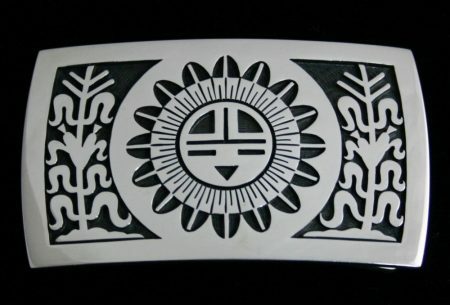 The piece features three bear designs, symbolizing protection and guidance with pottery symbols, a half moon, and star. 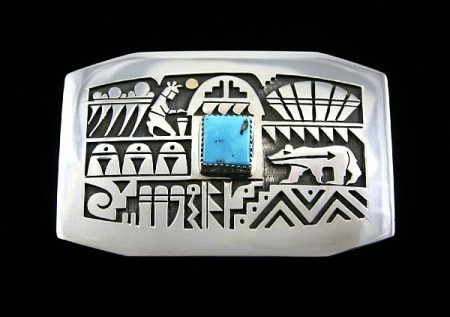 Wonderful triangular shaped cutouts are portrayed in the upper and lower portions of the item with small circles in the center. 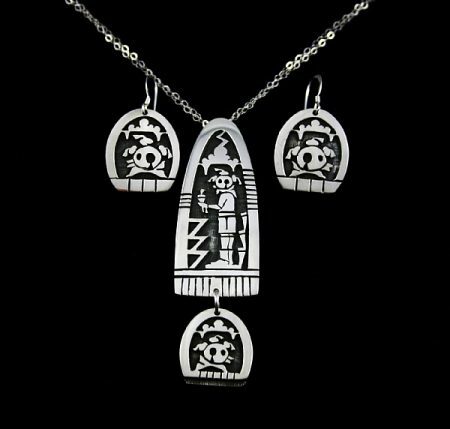 The detail of the piece is brought out with deep oxidation providing a darkened background making the symbols very eye catching to the viewer. 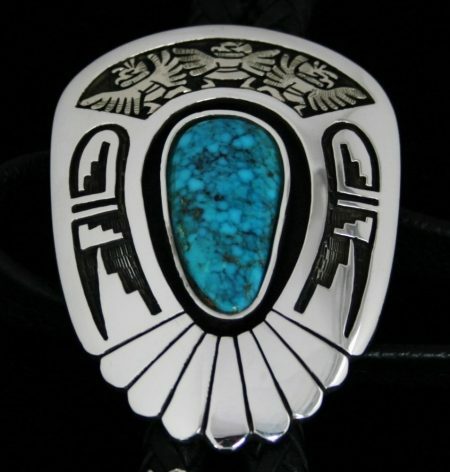 This exquisite one of a kind piece was created by award winning Hopi artist, Chalmers Day. The item portrays exceptional overlay in sterling silver with precise detail. Rare Candelaria turquoise is displayed in the center of the item with a gorgeous sky blue hue and chocolate brown matrix. A bear profile is seen next to the stone, symbolizing protection and guidance. A corn maiden grinding corn crops is featured in the upper left hand corner with the storm clouds and rain at her back. A solid 14K gold sun is depicted just above her head followed by two separate pottery designs. 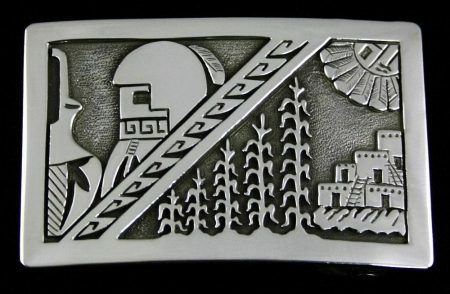 Prayer mounds and other Hopi religious symbols are also included in this piece.